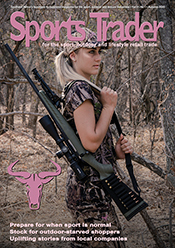 It will be business as usual at Sportsmans and Outdoor Warehouse despite the announcement that they will be listed on the JSE during the second half of the year, says CEO Kevin Hodgson. They will be listed as part of Holdsport Limited, with a turn-over of around R1.1-bn and good cash flow. Holdsport will consist of 33 Sportsmans Warehouse and 18 Outdoor Warehouse stores, as well as an investment in technical apparel and outdoor goods company First Ascent. “The market is growing, and there is opportunity for more growth,” says an upbeat Hodgson, who points out that they recently opened a new Sportsmans Warehouse (SWH) store in Pietermaritzburg and an Outdoor Warehouse (OWH) in Vanderbijlpark. In addition to the 51 South African stores, they also have a SWH store in Namibia. Apart from expansion plans — Hodgson envisages opening two to three stores per year over the next three to five years — he says the listing will have no impact on the day-to-day running of the company as the same management team and policies are in place (see Sports Trader April/May 2010). A pre-listing statement, including full details of the offer, open to eligible investors only, will be published in due course. They expect to list in the second half of 2011. UBS has been appointed as adviser and sole bookrunner. This will be Sportsmans Warehouse’s second listing on the stock exchange — but in 1998, when it was listed as part of Moresport, it was a vastly different company, with completely different shareholders, explains Hodgson. Then there were only six Sportsmans Warehouse stores, now there are 33. At that stage Totalsports was the most prominent component of the company, now there is no relationship between the two retailers. The opening of the first Sportsmans Warehouse store in Rondebosch in 1986 heralded a major change in the local sport retail market. It was the start of the leading role that this sporting goods chain would eventually play with their megastores. In 1996 Eric Logan and Dave Stewart sold Sportsmans Warehouse and two years later Moresport listed them on the JSE with Totalsports, bought from Morkels. Some statistics and facts quoted by several witnesses before the Competition Tribunal tasked with deciding whether the 51% stake Walmart wants to buy in Massmart (Makro, Game, Dions, Builders Warehouse, etc.) would be in the public interest, didn’t make it into print. It makes for interesting reading. Andy Bond, executive vice-president of Walmart Stores. Pattison: Massmart does not have a formal procurement policy — its philosophy is based on good retail practice and a focus on diversity of supply. With reference to products sourced from local suppliers, but imported by them, the value add of those local suppliers determines their competitiveness. The value-add, other than managing supply chain costs together with the retailer, lies primarily in the ownership and management of the brand. A well-managed brand communicates a price-quality trade-off, trust, support and service, warrantees, reliability, ethics, and related considerations. Whilst it may be possible to source a similar product from the same manufacturer, it would have to be under a different brand. Therefore, it is the management of the brand that is the source of the competitive advantage. As long as consumers desire that brand, we will source it from that supplier. When that is no longer the case and the value-add of the brand is less than the price premium it generates, then consumers stop buying it, and then so does Massmart. RBB Economics: The disintermediation of low-value added distributors will result in a shift from indirect to direct imports. Also, Massmart will likely secure price reductions from multi-national corporations (MNC) against whom Walmart can leverage its global scale. Whilst this would potentially result in Massmart securing lower prices at the expense of the MNCs or their local representatives, it does not logically necessitate any change in the sourcing of those products … The most likely consequence is a straightforward reduction in the prices charged to Massmart by the SA subsidiaries and distributors of MNCs, potentially with those local representatives compensated to some extent by the MNC through a change in the terms of the arrangements between them. Lichtenstein: Walmart led the way in squeezing labor costs out of its domestic US vendors, and in the process prepared the way for the wholesale shift of its purchasing to East Asia and Central America. Walmart would increase domestic purchasing, but the company used the prospect of such procurement as a hammer to drive down supplier costs. Scasserra: Walmart’s strategy in Argentina was not primarily focused upon reducing wages, but reducing others’ costs related to the supply chain. They have a 90 day payment policy, which has a devastating effect on small businesses who cannot meet its terms and many are prevented from becoming suppliers. They offer the sale spot to suppliers, instead of buying production, so the suppliers carry the cost of unsold products. Discounts are passed on directly to the producer/supplier, sometimes without prior consultation. But Walmart did encourage a supplier to follow more fair labour practices. Pattison: Massmart does not in any way prevent sourcing of products based on the size of the supplier. Notwithstanding this, Massmart’s experience is that it is very difficult to find small manufacturers that meet the requisite national standards. Massmart is committed to promote procurement of SA manufactured goods and services and will work closely with the EDD, DTI, DAFF, organised labour and other stakeholders to identify opportunities to support and develop local manufacturing with the objective of contributing to job creation. Importantly, however, such initiatives must be addressed at an industry level; and at no stage during Massmart’s engagement with stakeholders around the proposed transaction has it indicated any preparedness to accept a legally binding commitment to maintain and scale up local procurement. RBB Economics: The strength of local brands is not confined to food and drink. For example, within the category of office supplies, there is significant brand loyalty to local brands, with local suppliers using extensive in-store and marketing promotion to help build and maintain their brands. This results in the purchase of domestically produced A4 paper in almost all cases. Another example is domestically sourced cooler boxes, which cost around 20% less than imported equivalents. In an independent Chilean supplier survey (the Advantage Mirror Report) conducted in 2010, 15 suppliers were asked to evaluate 12 retailers in five key performance areas like business relationship, category management, business development, etc. Walmart was ranked as the top performer overall — 56 points higher than the average, and the top performer in all five of the key areas. Genesis Analytics: What clearly matters is Walmart’s global purchasing power rather than the purchasing power of the local operations in each country. As the largest retailer globally, Walmart, with sales of over $400-bn, is many orders of magnitude larger than Massmart, with sales of under $7-bn, and other domestic retail chains. This global purchasing power permits Walmart to negotiate larger, global orders from the supplier and secure significantly better prices as a result. It also makes Walmart less prone to the difficulties experienced by domestic retailers, such as minimum order sizes, and also enables Walmart to lower costs further by engaging in direct imports rather than operating through agents and negotiating private label brands. For example, Walmart established a Global Procurement (GP) division in Shenzhen, China, in 2002, employing 1 400 people working out of 28 offices in 24 countries. By 2010 this GP accounted for about 30% of Walmart purchases, coordinating merchandise sourcing from more than 5 000 factories in 65 countries. An example of such a GP office is the IPL office Walmart had set up in SA to buy citrus fruits. By following this direct procurement strategy Walmart can cut prices by 10-20%, found an academic study by Brenner, A.B. Eidlin, L. Candaele (2006). Walmart’s sheer size means that it is often one of the more important buyers — for example, Walmart is the biggest customer of Procter & Gamble (P&G) with orders as big as P&G’s next nine customers combined. Mbongwe: The wholesale and retail sector is the fourth largest contributor to SA’s GDP with a contribution of around 14%. There are 80 353 retailers and 33 427 wholesalers, 87% being small enterprises, while only 9.5% are medium and 4.5% large. The sector employs about 3 020 666 people, or 16.5% of the active workforce — 21% in the formal sector and 47% in the informal sector. The sector accounts for just over 21% of formal employment and 47% of informal employment. The growth rate of the sector is 8.8%. While the large retail chains control 80% of the market, there are 60 000 employers in the retail sector. SMMEs and informal traders constitute the bulk of the sector. The retail sector has approximately 800 000 jobs, but only 200 000-250 000 of these are with the large chains, the remainder is in SMME and informal businesses. Large retailers already enjoy a significant advantage as it is difficult for most small operators to access financing and credit on favourable terms and the cost that smaller operators must carry are greater than the large firms. For example, wholesalers will not deliver to smaller firms, resulting in greater costs to obtain inventory than larger retailers, even after the difference in volumes is taken into account. RBB Economics: Massmart believes that it has identified a commercial opportunity to expand its own retail network in low income areas, and would do so with, or without, its merger with Walmart. The decline in the small and informal retail sector is well established. Traditionally, low income areas in SA have been served by small and informal retailers. With the exception of Woolworths, all the major grocery chains active in SA have started to extend their store networks into areas previously served by independents, spazas and hawkers. Data from Neilsen and the Bureau of Market Research clearly show that the share of national food retail sales by branded retailers to LSM 1 to 4 (the poorest consumers) rose from 33.9% in 2007 to 42.8% at the end of 2008, while sales from independents to this group fell from 64% to 54%. Sales by branded retailers to customers in LSM 5-6 rose from 60% in 2007 to 63.4% at the end of 2008, while the equivalent shares of sales by independents fell from 36.9% to 32.9%. Yet, sales by branded retailers and independents to LSM 7 and above consumers remained virtually unchanged. Scasserra: In Neuquen, Argentina, many stores in the area closed as clients started shopping at Walmart. In other areas the impact was limited by ensuring that Walmart opens stores where they were least likely to affect other smaller businesses. Pattison: Massmart’s current strategy, irrespective of the merger, was to expand existing floor space by approximately 8% in 2011, expand its floor space by an estimated further 8% in 2012, and expand floor space about 5% in 2013. Massmart does not expect that the merger will have any impact on their projections for 2011, but that the merger benefits will become more evident from 2012. Massmart has plans to open 50-100 new stores in each of its four divisions before the end of June 2013. RBB Economics: In terms of general merchandise retail sales in SA, Massmart has 17.5% share of the market (R7.8-bn), followed by Shoprite with 12% (R5.3-bn), Pick n Pay with 11% (R4.9-bn), Hi-Fi Corporation 4% (1.8-bn), Incredible Connection 3% (1.3-bn) and Stax 0.4% (0.2-bn). The rest of the 52% of the market share belongs to other smaller retailers. Currently Massmart procures more than 90% of general merchandise in SA, with less than 10% directly imported — leisure goods is the exception as direct imports account for more than 10% of purchases. Bond: Walmart operates 8 969 retail units under 55 different banners in 15 countries. Walmart had sales of $405-bn in fiscal year ending 31 January 2010 and employs 2.1-m associates worldwide. Walmart is the largest private employer in the world. It was founded in 1962 and incorporated as Walmart Stores, Inc. in 1969. Walmart’s operations are organised into three divisions, namely Walmart Stores US, Sam’s Club (membership stores selling only large format packs) and Walmart International. Walmart became an international company in 1991 when it opened its first Sam’s Club near Mexico City. In 1993, Walmart International, with stores with different styles and formats to fit local needs, was created. More than 75% of Walmart’s 4 556 international stores operate under a different banner. Walmart International has grown revenue from $60-bn to over $100-bn in the last four years, and achieved a compound annual growth rate of 16% over the last 10 years. The majority of Walmart’s products are sourced locally. For example: in Mexico, India and Chile, more than 90% of products are sourced locally, and 95% of merchandise sold in China is sourced locally. Of these products, nearly 50% is sourced from the local cities in which Walmart operates. * Brenner, A.B. Eidlin, L. Candaele (2006):Walmart Stores Inc. A paper prepared for the International Conference: ‘Global Companies-Global Unions-Global Research- Global Campaigns’.